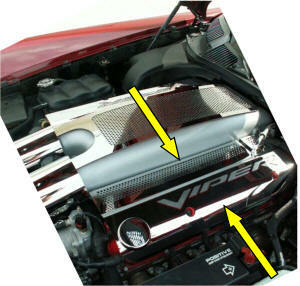 Stainless Steel highly polished Viper SRT-10 Header Plate. The Ultimate show car piece! As soon as you open the hood it jumps right out at you. Precision laser cut for the finest craftsmanship. 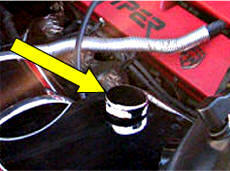 Easy installation using factory nuts and professional grade automotive tape. 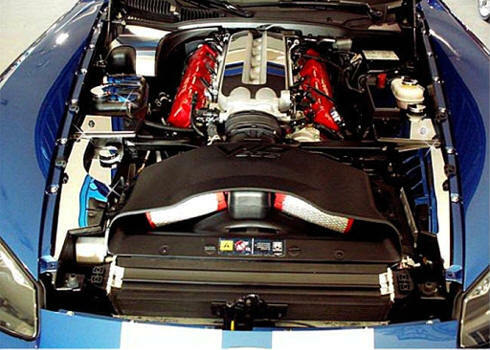 This piece really high lights your monster 505 HP engine. 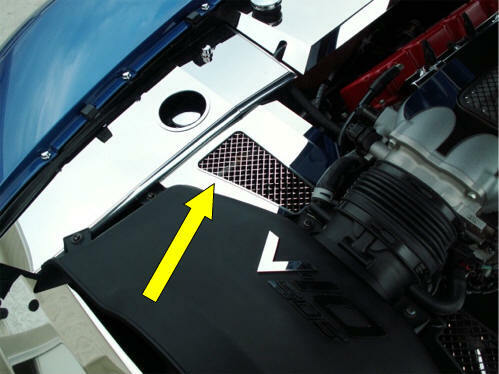 Note: Will not fit with "Typhoon" Air Box Intake Kit. 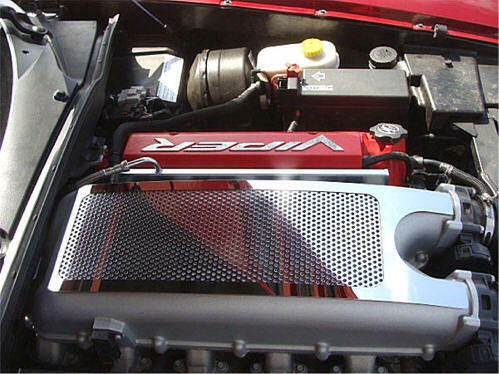 This piece really high lights your monster Gen 4 engine. 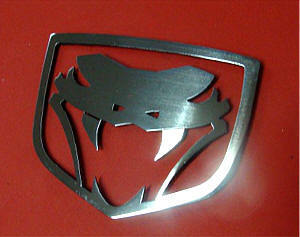 Can be mounted on the engine, in the engine compartment, in the interior or on the body or anywhere else you like. 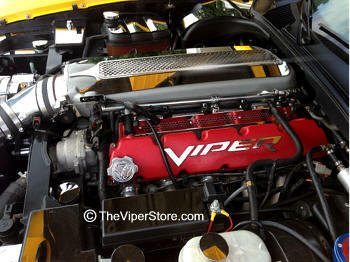 Check out our Gen 3 Viper with a completely decked out engine. 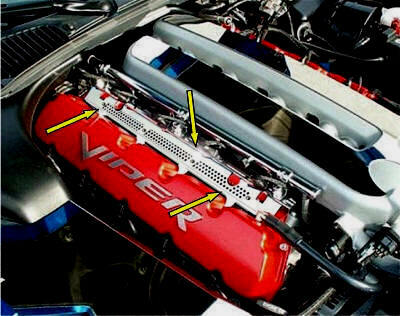 Stainless Steel highly polished Viper Plenum Trim sits on top of the engine manifold. WOW what a difference - when you see it on! 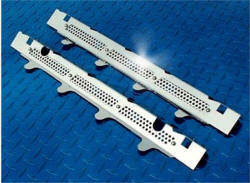 High Polished Stainless Steel Fuel Rail Covers with perforated breather windows. 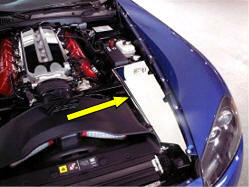 Covers up a messy looking area of your engine and - Gives your engine manifold that show car finished look. 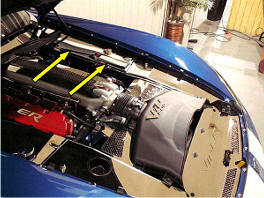 Does not effect engine temperature. 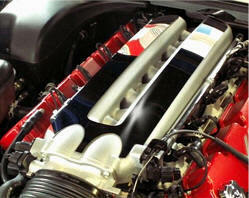 What a difference this makes on your engine appearance! Will not rust or corrode or come off. WOW! - A Real Jaw Dropper! 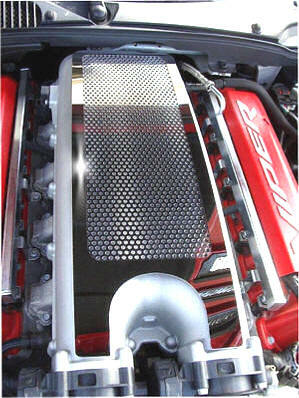 All stainless steel high polished engine perforated plenum cover. WOW! What a difference. 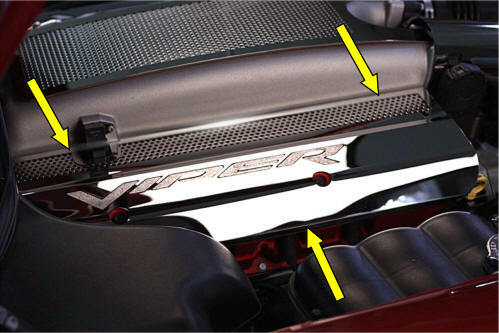 Really helps to punch out your engine compartment. Easy installation. WOW! - Another Real Jaw Dropper! 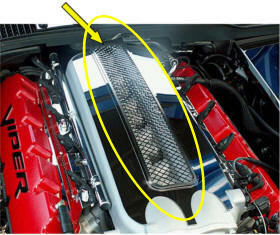 All stainless steel high polished engine perforated Fuel Rail covers set of two. 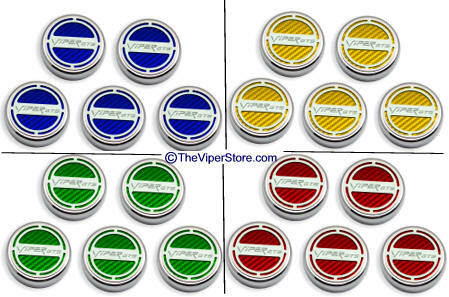 This seven (7) piece engine Trim Kit is a different style than the individual component covers. 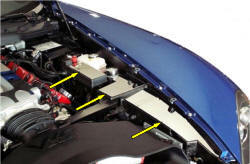 This kit is smaller shaped top panels (where as the individual component covers are in fact covers) for inside the engine bay. 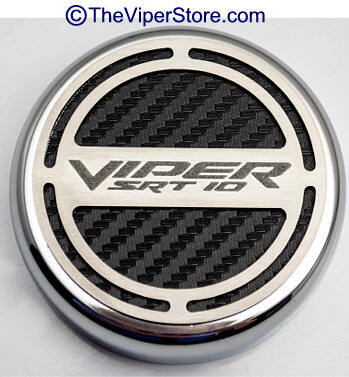 Make your V-10 engine stand out with this custom all highly polished stainless steel cover plates. 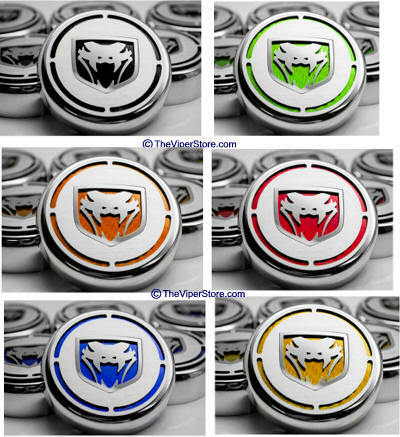 NOTE: Chrome Fluid caps are sold separately see bottom of this page. Easy installation - simply peel and stick. Some pieces require slight bending by hand to match components' curve. 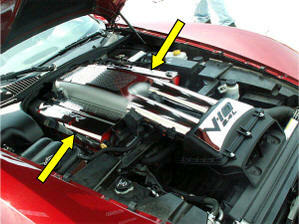 Turns your Viper SRT-10 into a show car when you open the hood to show off that the V-10 beast! Component Chrome Caps sold separately on this page Part# ACC-973009. 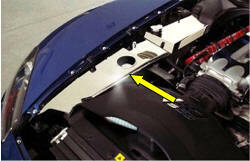 All stainless steel Brushed or Polished Finish Air Box Cover inside the engine bay. Easy installation - simply peel and stick. 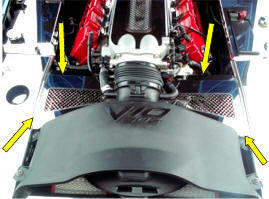 Requires bending by hand to match air box curve. 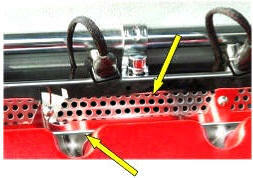 Can easily be removed without damaging your Air Box. 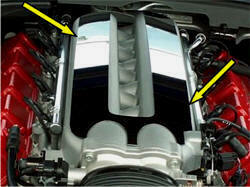 All stainless steel Polished Finish Radiator Supports inside the engine bay. Cut in beautiful laser mesh these really stand out for a wow effect when you open the hood! 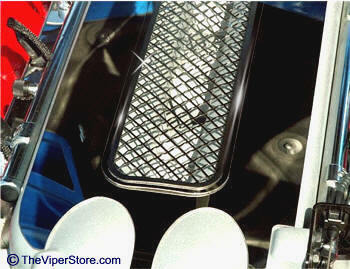 Deluxe Stainless Steel Show Car Quality Inner Fender Covers. Two pieces one fender cover per side. Comes with Chrome cap. Easy installation with 3M Professional Grade automotive tape. Not effected by engine heat. Part is pure stainless steel will not stain, rust, corrode, or tarnish. 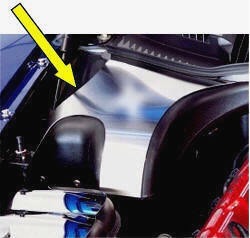 ACC-973013 Dodge Viper SRT-10 (2003-2006) Stainless Rear Inner Fender Cover with two Chrome caps. 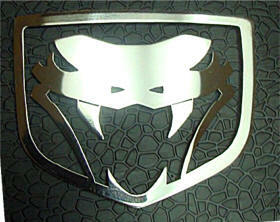 Inner Fender cover for the drivers side. All stainless steel in a high polished finish. Easy installation with 3M Professional Grade automotive tape. Not effected by engine heat. Part is pure stainless steel will not stain, rust, corrode, or tarnish. 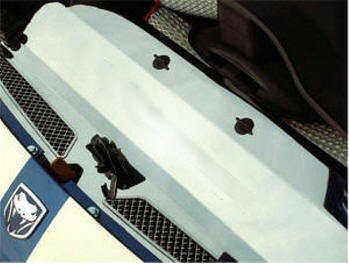 Deluxe Stainless Steel Show Car Quality Water Tank Cover. 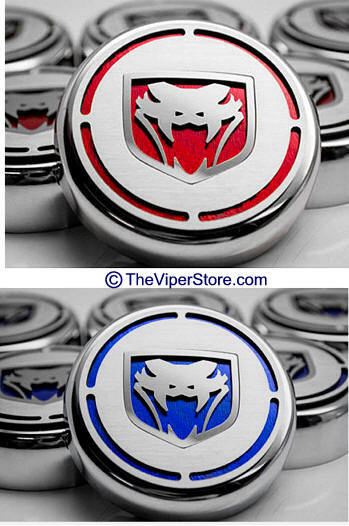 Comes with Chrome cap. 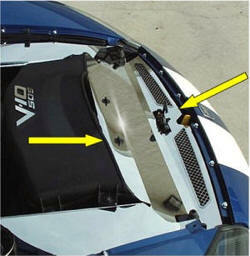 Easy installation with 3M Professional Grade automotive tape. Not effected by engine heat. Part is pure stainless steel will not stain, rust, corrode, or tarnish. 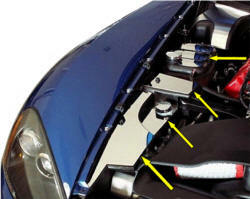 NOTE: This part looks best when it is mounted with the Inner Fender Covers. 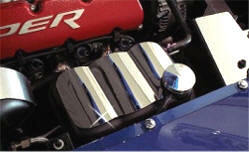 Chrome metal cap for any engine component. 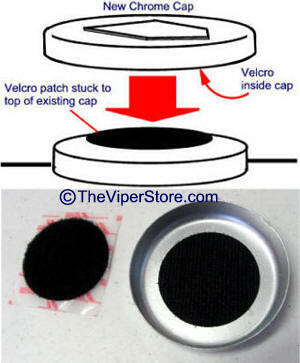 Fastens on top of stock cap with Velcro. 2.75" inner diameter.